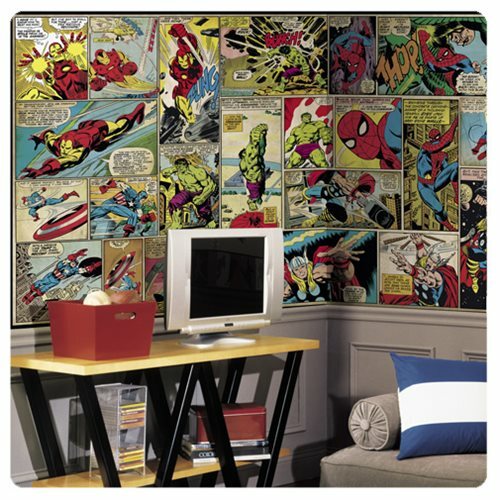 Scenes from your favorite Marvel comics meet fast, fun, and affordable room decor with this Marvel Comics XL Wallpaper Mural by RoomMates Decor! Featuring thrilling scenes ripped straight from your favorite comic books, this Marvel Comics wall mural exhilarates any room. Designed with all of your favorite Marvel superheroes including Spider-Man, Captain America, Thor, and many more, the assembling process is easy! Spray each of the seven panels with water and add each panel side-by-side on the surface of your choice. Measures 10 1/2-feet wide x 6-feet tall when fully assembled.